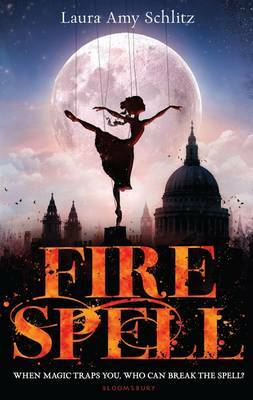 A very old witch, a puppet master, three young children and Victorian England – that’s Fire Spell. Laura Amy Schlitz’s novel follows a myriad of characters whose lives are thrown together at a birthday party for young Clara Wintermute, a rich girl whose brothers and sisters died of cholera years previous. Following her party she goes missing, and the prime suspect is puppeteer Grisini, whose puppet theatre performed at Clara’s party. Cruel and all-round disgusting, Grisini disappears after falling down a flight of stairs at his lodging house, leaving his two wards Lizzie Rose and Parsefall to fend for themselves. They soon discover Grisini has turned Clara into a puppet, and then find a letter from a woman summoning Grisini to visit her. They set off for Windermere, and the mansion of Cassandra, an old witch on her deathbed who is determined to get rid of the fire opal she has been carrying around for decades. Fire Spell is aimed at pre-teen children, but coming in at close to 400 pages and with quite slow pacing, I‘m not sure it would have been something I’d have enjoyed as a 10-year-old. To me, while the core story was good, I felt it wasn’t executed brilliantly, and Schlitz sometimes spent 200 words talking about something when she could have used 100. In addition, the chapters flitted between different people, meaning there were some characters I felt I barely knew, and others who I wanted to see less of. The novel is set in 1860, and I sometimes felt its descriptions of Victorian England and its characters were stereotypes – I mean, what kind of a name is Parsefall for a child? This could be because Schlitz is an American author (by the way, the novel is called Splendors and Glooms in America), and so is writing to American stereotypes of Victorian Britain, or it could be for some other reason. Whatever it was, I felt like sometimes I was only reading about the surface of the world Schlitz created, and there was not much beneath that surface. I was anticipating really liking Fire Spell, and while it had some interesting turns, it unfortunately fell short for me. First review I have read for this one. Disappointed, it looks and sounds great, sorry it let you down. Ah too bad you were let down, looks such a fun book! It just fell at the bottom of my TBR pile. Sorry, I don't want to put you off! I don't regret reading it, I just found myself wishing for something a little bit more as I was reading it. Oh no, I feel guilty now. Maybe I didn't love it as much because it's been a while since I've read something for younger readers, and I couldn't get into the rhythm. I guess sometimes you love a book, and sometimes you don't.